Above ground pools are known for being affordable, easy to install and maintain, and portable, among other things, making it a great alternative to an in-ground pool. Summer or not, it provides an excellent way to relax and have fun! While there are countless options for an above ground pool, do not choose just any product. Consider the material, size, shape, durability, safety, and price, among other things. If you need help deciding, keep on reading and we’ll list down some of the top options on the market. What are Above Grounds Pools Made Of? Should Above Ground Pools be Installed by Professionals? How Do You Choose the Right Size of an Above Ground Pool? How Long Should You Run the Pool Pump? How Often Should you Backwash? 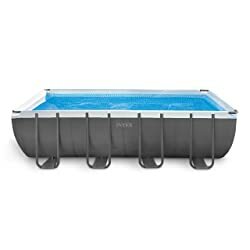 What is the Best Way to Light Up an Above Ground Pool? How Do You Choose the Best Location for an Above Ground Pool? How Do You Move an Above Ground Pool? To help you decide, we researched some of the products on the market, as well as the features that make them impressive. This is made by one of the best companies in the market for an above ground pool. It is available in three sizes. 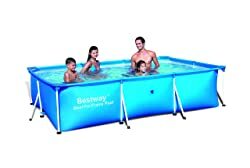 The main material that is used in this above ground pool is the Super-Tough Laminated PVC, which is complemented with durable and easy to assemble metal frames. The latter makes sure that the pool stays in its shape while providing the support that it needs. However, while it is already inclusive of a 530 gph pool pump, this may not be enough to provide the power that the pool needs. Some people decide to go for an upgrade. Another pool from Intex, this rectangular pool has a maximum capacity of 4,545 gallons and can be filled up to 90%. It comes with an innovative frame design to ensure its longevity. Plus, there is an Easy Lock System, which will make it effortless to connect the frames without requiring any tool. There is a ladder that is included, making it easy to get on and off the pool. However, there are some users who expressed their concerns over how the ladder can be wobbly at times. The set is also inclusive of ground cloth, debris cover, pool liner, and sand filter pump. If you would rather have an oval-shaped above ground pool, this can prove to be an excellent alternative to the two products that have been mentioned above. It has powder-coated steel frames that can resist rust. It has a maximum capacity of 2,885 gallons and can be filled with water in just about half an hour. You can be confident that the water in the pool stays clean all the time without the need for frequent cleaning. This is possible because of the Krystal Klear cartridge filter pump that comes with the package. From the Intex pools that are mentioned in this post, this is perhaps the most straightforward to assemble. There is no need for complications as there are no steel frames that you have to install. All that you have to do is spread the pool an even ground, inflate, fill with water, and enjoy. The sidewalls are made of tough laminated PVC, which has been praised by many because of its durability. This pool has a maximum capacity of 3,736 gallons. For the best outcomes, the manufacturer recommends that you do not set the pool on loose soil, mud, or sand. One of the best features that you can find in this product is an innovation that is known as Hydro Aeration Technology. With this, circulation and filtration are significantly improved while providing the pump with more power. The three-ply material that is used as the main material of the pool is also exceptional since it is puncture-resistant. It also has metal frames with powder coating, which makes it long-lasting. As for the water capacity, it can hold up to 12,481 gallons, making it one of the largest from the above ground pools that are mentioned in this post. This above ground pool has a rated maximum capacity of 4,231 gallons, making it a great choice for a small family. One of the things that you will love in this pool is the use of a 3-ply wall that will provide an assurance of its durability. There are also solid steel frames that can effectively hold the pool in its place as long as the recommended capacity is followed. Nonetheless, you might have problems with the design of the water inlet and outlet, which is made of flimsy plastic. This is from the same company as the pool above, but the main difference is that it is rectangular and smaller. The maximum water capacity is only 872 gallons. Using this pool will be a snap for most of you. The assembly and takedown can be completed in a few minutes and without requiring tools. Because this is pretty much a small above ground pool, it is best to limit its use for kids. The space can be quite limited for a small group of people. From the three pools from Bestway that are mentioned in this short guide, this happens to be the largest, which has a maximum capacity of 7,937 gallons. Construction-wise, this can also prove to be exceptional, providing an assurance that it will be durable. The side walls are made of polyester and PVC. The metal frames, meanwhile, are rigid and rust-resistant. To provide value for money, it comes bundled with several accessories, which include pool cover, ground cloth, pool ladder, and sand filter. There is a reason why this swimming pool is expensive – it includes almost everything you will need. Aside from the actual pool with a frame, it also comes a ladder with safety barrier, sand filter, and skimmer. The pool has a 20-gauge all-weather vinyl liner, which, according to many of its users, can withstand the test of time. It also comes with hot-dipped galvanized steel parts to ensure longevity. To provide you with peace of mind, it is also good to know that the manufacturer is offering a 35-year warranty. This is another option that promises to provide value for money by providing almost anything that you will need to build an above ground pool in the backyard. It is already inclusive of a deluxe filter pump and a heater, so you can swim comfortably even when it is cold. One of the best features of this product is the patented dual tether system. Basically, this is an exclusive technology that will allow you to adjust the resistance by simply turning a knob. Although this is made by an unpopular brand, this is another above ground pool that excels when it comes to durability. It is designed with a 7-inch galvanized steel ledge and has Prema 25 Series all-weather vinyl liner, which will help ensure its durability. The package is inclusive of a 19-inch sand motor that is powered by a 1 HP motor. With this, you can have the assurance that the pool water will remain crystal clear. Lastly, the pool comes with an extensive 25-year warranty from the manufacturer. This above ground swimming pool has a 100% virgin vinyl overlap liner, which comes with a bedrock design to make it more appealing. Coping strips are also included for easy installation. As for the pool specifications, it has a height of 52 inches. The estimated maximum capacity, meanwhile, is from 7,000 to 8,500 gallons. There are 12 verticals that will help ensure the stability of the pool. The pool has a 10-year limited warranty. For the warranty to be valid, make sure to not sink the pool into the ground. 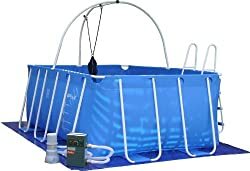 This is a DIY assembly kit that comes complete with everything that you will need when setting up an above ground pool. It comes with a pump, pool liner, skimmer, and a ladder, as well as a chemical cleaning kit. The all-steel construction is one more thing that you will love in this product, especially if you are looking for durability. However, there are some users of this pool who complained about how the assembly can be quite tricky, so be sure to pack a lot of patience! This compact above ground pool has a maximum water capacity of only 801 gallons. Because it is small, you can expect that it is filled with water in approximately half an hour. Take note that this is relatively smaller compared to most of the options that are mentioned in this post. It is not as sturdy as the higher-end counterparts. It will restrict the use to kids. While this is made by Coleman, a trusted brand of outdoor products, it is not as popular as those that are from Intex. Still, this makes a good choice if you are looking for above ground pools. The body is made of superior steel frame, making sure of its stability and durability. It can accommodate a small group at a time while providing an assurance that the frame remains stable. A lot of you might have some questions about above ground pools. In the section below, we will try to provide the enlightenment on some things that you are most probably wondering about. There are different materials that are used in the different portions of the above ground pools. Most of the high-end options are made of aluminum. Meanwhile, the cheaper ones are usually made of stainless steel frames. Resin is also a common material these days, often combined with steel. Meanwhile, for the side wall, it is often made of durable vinyl. Several layers are often incorporated to make it thicker and to resist punctures, among other external elements that could speed up wear. In the case of most models of above ground pools, you do not need to pay someone to complete the assembly for you. Often, it is inclusive of almost everything that you will need to have a pool, including detailed instructions on how to complete the assembly. Some of the large above ground pools, however, can be too complicated for the average Joe. In some instances, the manufacturer will state that it should be installed only by their representatives. If not, there is a risk that the warranty will be voided. Often, it all boils down into personal preferences. You have to think about the number of people who will be using it at the same time to determine the right size of the pool. Space availability in the backyard will also affect that decision that you will be making. Obviously, if you have limited space, a compact above ground pool is the right choice for you. One of the most important parts of the above ground pool is the liner. It is often color blue while the others are patterned to upgrade the looks of the side walls. Often made of vinyl, they provide both form and function. There are two main types of liners for above ground swimming pools. The first one is a beaded-style liner. It has a small lip or groove that is located on the edge of the liner. It is the one that snaps directly to the track. Meanwhile, the second type is an overlap-style liner. Rather than having a grooved end that is hooked, it is folded on the top of the rail so that it won’t collapse once filled with water. There are two main uses for the pool pump – to get rid of dirt in the water and to produce chlorine. The size and the extent of use of the above ground pool are just some of the things that should determine the duration of running the pool pump. In the case of most models, it will be enough to run it during the use of the pool. This will be sufficient to ensure clean and safe water during swimming. Turn it off when the pool is not used to save money. The filter is one of the critical components of the above ground pool as it keeps the water clean. Over time, it can be dirty. With this, you need to backwash. Simply put, backwashing refers to the replacement of dirty pool media. It gets rid of the dirt and contaminants that have been collected by the filter. It improves cleanliness while also making sure of the right circulation of chemicals and water. If you use the above ground pool regularly, it is recommended to backwash at least once a week. Do this immediately once you are done with vacuuming. To ensure safety while also adding aesthetic appeal to the above ground pool, lighting will be critical. The best way to light it is to use lights that you can install on the top without the need for complicated installation. It should have a holder or stand. Nonetheless, you can still use underwater lights if you wish. There are battery-powered lights that can be submerged in the pool without worrying about electrocution or the need to make a wired connection to the source of power. One of the most important is to make sure that there is enough space for the pool and for the users to move around. It should be on a stable surface and should not be muddy. Avoid leveling the pool on loose soil or rocky bottoms. As much as possible, avoid installing the aboveground pool under a tree. While it is a good thing that it provides shade, it can easily become dirty because of the falling leaves from the tree. Above ground pools are known for their mobility. However, this does not mean that you can just move it around in any way. To avoid damages and injury, be sure to do it properly. If it is already up and you want to move it to a new place, the first thing to do is to take as many pictures as you could from all angles. These will be your visual clues in the reinstallation. Make sure that you unplug the pump first. Remove any excess water from the pool and disassemble. Keep all the parts that you have earlier removed. Now, move to the new location and start with the process of reinstallation. Before running the pool, be sure to replace the sand filter. Indeed, above ground pools are an excellent investment! It can quickly transform the yard and make it a fun place, especially for kids. Nonetheless, not all above ground pools are created the same. To avoid having regrets, be sure to consider the products that we have listed above.